Washington, April 11: South Korean President Moon Jae-in meets with Donald Trump at the White House on Thursday to try and find a path forward from the debris of a failed nuclear summit between the US president and North Korean leader Kim Jong Un. Both Trump and Moon are heavily invested in bringing North Korea out of the cold but the unsuccessful summit in Vietnam at the end of February was a setback for the two allies that has yet to be resolved. 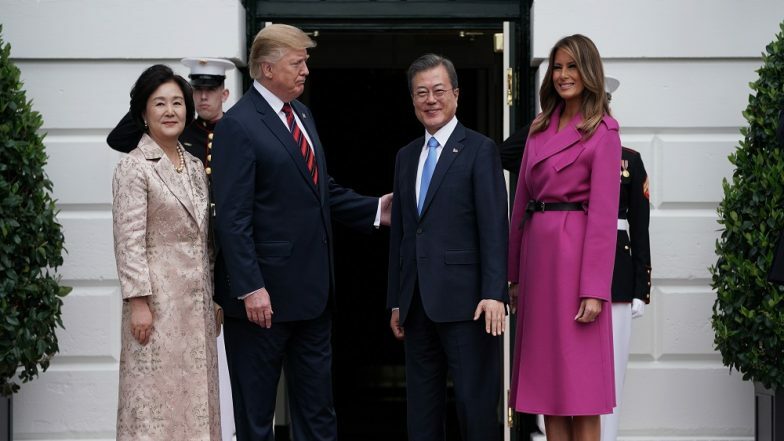 Trump will give Moon and his wife Kim Jung-sook the red carpet treatment at the White House before talks in the Oval Office. Although trade and the role of the huge US troop presence in South Korea are hot topics, North Korea dominates. "The two leaders will have in-depth talks ... to coordinate their stance on setting up a peace regime on the Korean peninsula through complete denuclearisation," Yoon Do-han, the senior South Korean presidential press secretary said ahead of the visit. Trump will give Moon and his wife Kim Jung-sook the red carpet treatment at the White House before talks in the Oval Office. Trump has emerged as an unlikely peacemaker in the Korean peninsula, reversing his initially bellicose approach with a determined effort to put Washington and Pyongyang on a historic path to reconciliation. But if an initial meeting between Trump and Kim in Singapore last year broke the ice, the follow up in Hanoi ended with no progress on US demands for North Korea to start dismantling its nuclear weapons program or North Korea's desire to see an easing of international sanctions. The two leaders cut their talks short, skipping a scheduled final lunch and the expected issuing of a joint statement. In Washington, the Hanoi outcome brought Trump praise from Republican legislators who'd worried he would give too much away in pursuit of big headlines. Trump continues to face criticism that he is out of his depth in talks with Kim and that sitting down with the dictator has yet to bring much benefit. But he insists that while he retains an unusually good personal relationship with Kim, he will maintain a tough negotiating line. "Sometimes you have to walk," Trump said, slipping into his real estate dealer's lingo, after the Hanoi meeting. For Moon, the aftermath has been even more complicated. But Moon's plan to unveil details of such projects on March 1, right after the Hanoi summit, was scrapped and he is under pressure from opponents on the right. One lawmaker branded him the North Korean's "top spokesman." Kim himself has used the impasse to speak out against international sanctions and warn in colourful, defiant terms that his country will not bow to pressure. The socialist economy will "deal a telling blow to the hostile forces who go with bloodshot eyes miscalculating that sanctions can bring the DPRK to its knees," a state media report quoted him as saying on Thursday, using the acronym for the North's official name.